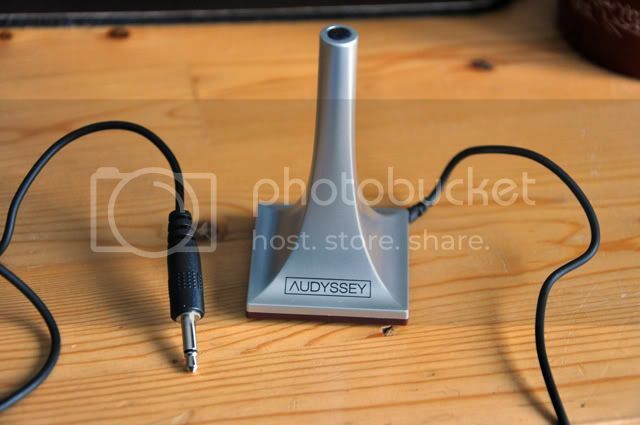 Apart from the obvious that you need to have plug in the microphone (3.5mm) stereo jack into the Setup Mic hole on your Audyssey-built in AVR, you need to ensure the following has to be implemented BEFORE you commence the audio calibration process. 1) Always use the stock microphone from the AVR. Forget about the so-called professional-grade third party SPL microphone that is suppose to be better in taking the "ping" noise blar blar blar...as such you will get a more accurate reading...Well, then you are in for a rude-awakening...believe it or not, the stock microphone has been pre-calibrated in the factory for your specific make and model of the AVR. You can't just simply swap a Yamaha calibration microphone and use it on Audyssey-built AVR. The readings taken will not be accurate! 2) There is NO NEED for you to meddle with any of your AVR settings in your PRIOR to the calibration! This may not be clear at first for most, even for the experienced users. You might have read or heard from some AV forum or your friends that you SHOULD set your speakers to "SMALL" and cross-over to "THX-80Hz" etc. Now, you will be asking yourself, do I set it BEFORE or AFTER the calibration? The answer is - "AFTER-CALIBRATION". Even many websites that you visited did not specify this clearly upfront. Well now you know it...All you need to do is to connect the stock Audyssey calibration microphone to the setup mic jack on the AVR and make sure that you are using a camera tripod to ensure that the microphone is properly mounted and firmly planted at your sweet spot - it can be your sofa or recliner. 3) Next adjust the height of the camera tripod to your "normal" seating posture whilst watching a movie. After setting up your mic and adjusted it to appropriate listening height, you will need to ensure that your seat is not too close to the back of the wall. Yes, sadly, if you want accurate readings, you will need to throw away that "WAF" thingy out of the equation. The decision is up to you whether you want to enjoy optimum cinematic sound at your own home or you want to please go for aesthetics...if it is the latter, then I guess you can stop at this stage. The sole reason behind this is to ensure that the SPL reading will not be affected by the room mode anomaly commonly known as the "boundary gain" effect. 4) Optimal speaker placement and positioning is another key element/aspect that you need to ensure BEFORE you start the calibration process. Depending on your room shapes and sizes, as far as possible...try to position the 5.1/7.1 speaker arrays at an equidistant using the sweet-spot of the center point. Yes, you might have read about the THX or even the Dolby Labs proposed layout of the speakers in a home theater environment...I leave it to you to do that to your best of your ability. I do not see the point of asking you to do something that is BEYOND YOUR CONTROL (i.e. shape and size of your room). So in short, try to ensure the speaker arrays form a "circle" that "surrounds" you...common sense, isn't it? 5) Toe-in your front main left and right speakers at about 30 degrees...DO NOT toe-in too much or else you will limit the "soundstage"...If you dun like arithmetics, then just ensure that the front right and left speakers point at your respective "shoulder-level"...and not your "head". The surround speakers for a 5.1 layout, preferably should be slightly behind your ears. And if you have a Surround Back channels, then it should be placed "out-of-sight" (common-sense)...if you are able to turn your head at a right-angle and could STILL SEE THE SurrBack speakers, then you should consider placing the SurrBack speakers behind your head (idea is to stay out of sight)...it makes no sense if your Surrounds and SurrBack speakers are placed very near to each other! Then you will have a problem with "localizing" the sounds. 6) After which, ensure that the tweeters of your front main left and right speakers are adjusted (with the help of a speaker stand for bookshelf speakers) are at ear-levels...cannot be too low or too high. In my home theater setup, I have a built-in platform to help me raise my bookshelf speakers at optimal ear-level...so this is something for you to consider especially when you are doing renovation for your home theater room. The center speaker should preferably facing you...if it is placed too low- say at your chest or your tummy level, then you should consider using a door-trap/stopper with an elevated angle to help in "elevating" the speaker drivers to face you. This will make the dialogue more intelligible and ensure more accurate readings. 7) During the calibration, Audyssey will by-pass all the DSP and set the volume level at Reference level (usually at 85db level). So you need not worry about whether or not to reset the previous speaker levels, to bypass Bynamic EQ or Volume feature etc...What happens during the Audyssey calibration process is that it will three set of things...setting proper distance, setting correct amplitude of sound level and applying the appropriate correction filters at each frequency levels. Concurrently making necessary adjustments to the speaker cross-over settings and roll-over frequency for each and every speakers in the array. For the subwoofer, by ensuring that you set the Low-Pass Filter (LPF) to the highest point in your AVR setting helps to ensure that none of the highest frequency will be sent to the subwoofer. What we want is only the low frequency (LFE) to process by the subwoofer. During the calibration, Audyssey allows you to calibrate to as many as up to 8 listening positions in your room to ensure every seat gets its own unique "sweet-spot"...Well, this is easier said than done. If you only have one seat, then it is very easy. But if you have two rows of seats and placed at different locations and worse not at equidistant from the ideal listening layout, then you are going to have a problem. What Audyssey does is do do "averaging" for the various sound spots. And yes, it is a lot of "guess-work" involved with some heavy-duty arithmetic processing by Audyssey here. Over the years, Audyssey "algorithm or crudely put it - guess-work" has gained significant traction and I must say it is pretty darn accurate. As a rule of thumb, try to have at least 5 - 6 listening positions measured to allow the Audyssey to do a more accurate calibration in this aspect. If you only have one "emperor seat", then minimum of 3 readings should suffice. Just ensure that you turn down any electronics such as Air-conditioning, fan or even your lighting etc off during this process. Make the room as quiet as possible. Audyssey work best when the room is "sufficiently dead"...make a clap around the room (if you have a dedicated HT room) and make sure there isn't any echo or reverberation. 9) After the calibration process is completed. Unplug the microphone. The post-calibration is what most people missed out. What you need to do after the calibration has completed is to go to the audio/speaker settings of your AVR. i) Set the speaker size to small. If there is no option in your AVR setting to set the speaker size to "small", just ensure that the individual speaker cross-over hovers between 60Hz - 100Hz or above. Anything less than 60Hz can be labelled as "Large". The difference between a Large and Small speaker settings is not based on the "looks and built" of the speaker itself but rather how the AVR handles the roll-over of each individual speakers, ensuring the 80Hz and below frequency will be readily re-directed to the subwoofer to reproduce the LFE track of content source. Audyssey, like Dolby Labs recommend that all your speakers to be set at "small" even though you have a very capable tower speakers that are able to handle the LFE very well. So if after the calibration, the cross-over frequency is set to anything less than 60Hz, then it will be sensible for you to adjust the frequency up to 60Hz or higher. I know most enthusiasts will recommend 80Hz to be the ball-park figure to play around with...there is nothing wrong here. Feel free to do just that...BUT please bear in mind that you you should not lower the lower the cross-over frequency lower than your LPF. For instance, if your cross-over for the surround speakers are set at 100Hz. you should not lower it to 80Hz. Instead you should not need to adjust that cross-over setting at all. According to Audyssey, it is perfectly fine to increase the cross-over point but lowering it is not recommended as it will induce what it called, "audio-hole"...in layman terms, there is a "gap" in a particular frequency range that will not be corrected by the correction filters (only present in higher end models with MultEQ XT and MultEQ XT32). Q: Why expert recommend 80Hz as the most ideal cross-over? A: In a nutshell, the human auditory localization worked in mysterious ways..studies shown that anything below 80Hz, the sound will cease to be "directional", the sound becomes harder to "localize" - i.e. it becomes omni-directional. This is commonly referred to as the low-frequency effect (LFE). What we want to achieve is that the high frequency effect will be directed to the speakers for reproduction - "directional" and the LFE will be reproduced by the subwoofer. Such distribution of high and low frequency will help to alleviate some of the speakers in the LFE reproduction...let's face it, not all speakers are designed to do both high and low frequency very well...worse is not all our speakers are using the same make and model...dun even make me start with the Re-EQ and timbre-matching as advocated by THX...The best solution is to direct all LFE to subwoofer to prevent what we call, "double-bass' or "muddy-bass". Of course, I am discounting on the fact that there are times where properly calibrated (using phase control), one may experience an increase in headroom a smoother response. But this is rarely the case, unless your entire 5.1/7.1 systems are of the SAME BRAND. But we all know that SVS, Rythmik, Ken Kiesel etc made better subwoofer than say a matching one like Monitor Audio 5.1 system in a package. Q: After calibration, Audyssey "recommends" a 40Hz roll-over for my Mains? I dun understand why is that so IF the above argument holds true?! A: According to Audyssey, the roll-over at 40hz is actually "determined" by the AVR and not Audyssey. During the calibration process, the test tone generation for each speakers "send back" the information to the AVR to set the speaker roll-over at a certain range...based on the speaker capability. If you based your prediction solely on the "looks" like a tower speaker should have a lower roll-over since it is more capable to reproduce LFE at a certain range, then you might be wrong. I can safely say that we can choose to ignore it...As a general rule of thumb, for full range tower and bookshelf speakers, the ideal roll-over should be pegged at 60Hz - 80Hz while for a satellite speakers, it should have a range of 90Hz - 100Hz or higher. ii) Ensure that the Low Pass Filter (LPF) is set to the highest. In my Onkyo AVR, the highest LPF is set at 120Hz. You may ask what about the LPF knob or switch at the back of the physical subwoofer itself? What does it do? Well, quite frankly, you need not worry about it...you can literally leave that alone. But just to ensure that the subwoofer will "listen" to the command from the AVR, flip the switch or turn the knob to the highest point and leave it there. The LPF switch at the back of the subwoofer is usually meant for 2.1 speaker setup where the stereo preamp may not have a LPF setting built-in. Most of the AVR these days DOES NOT need that as most have LPF setting built-into it. iv) Leave other settings intact - e.g. speaker levels and distance. Don't mess with the distance and the speaker levels or you will indirectly screw up other settings like Audyssey Dynamic EQ. v) Whilst reviewing the post-calibration results, ensure that the subwoofer level DOES NOT exceed +/-6db. A correctly calibrated subwoofer should have very little need for change to the level (SPL)...This is the reason WHY you need to dial in the subwoofer to be at 75db before the commencement of the calibration process - for newer models. For older model AVR, you need can use a SPL meter to measure the subwoofer sound pressure to be at 75db before commencing the calibration process. If you do not have a SPL meter, then you can adjust the gain knob at the back of your subwoofer to somewhere between 11 o'clock to 1 o'clock. So if the trim values showed an extreme negative figure of say -8 or -10. You probably have your subwoofer's gain knob set too high. Lower it and re-run the calibration. Q: Why is there such a huge difference in the distance measurement for my subwoofer? Did Audyssey screw up? A: No. Audyssey did not "screw up"...In fact, Audyssey does not actually "measure" distance in its literal sense...what it does is measuring delay in signal that was send over from the speaker or in this case, the subwoofer to the listening position (where the calibration mic is located). The delay is due to the electrical delay inside the subwoofer. Recall when I mentioned that Audyssey uses correction filters? The use of filters will inevitably cause some "delay" in the signal. Hence a longer distance is used to "compensate" that...so it is perfectly normal to see a distance of say 5.5m away from the listening position when in actual fact, the physical distance is approximately 3.5m away. This helps to ensure that LFE complements ALL OTHER SPEAKERS in the array to ensure sound reaches the ears of the listener ALL AT THE SAME TIME. I will post more as we get along - most of the answers can be derived from the Audyssey official website if you bother to read up. I am merely condensing it into more digestible bits for everyone. Of course, most of what was mentioned in this post is based on my own calibration and setup experience over the years. I have tried many auto-calibration feature before but Audyssey still reigns IMO. Since most of us either own a Denon, Marantz or Onkyo...then I guess this Audyssey tips may come in handy. Just for sharing, Audyssey calibration "interacts" closely with your room modes...it is because of the room modes that is causing the difference in sound quality. What Audyssey tries to achieve here is to deliver the same level of auditory experience you hear in a dedicated showroom or perhaps your friend's setup and deliver it to your home. Whatever settings especially the roll over fq for individual speakers...it is the result of interacting with you room...hence whenever you change some layout in your room such as addition or removal of a piece of furniture or even seating arrangement because you just got yourself a bigger couch...you will need to re-run Audyssey again to ensure optimum sound reproduction for your speakers. You should only do auto Audyssey Calibration in the same setting as your normal movie watching condition , like when you watch with aircon on ? fan on ? room door closed ? curtail closed ? etc etc........ ? It does not screw up , but the version in the AVR does hv it limitation , freq below 60hz are almost non-directional , sometime those filter can cause confues when pick up by the mic , when given the right condition can make yr sub become localised. Is hard to believe, even a surround speaker use a over grade cable at the right condition ( when mixed with a wide coverage driver ) can cause loss of directional sound , but yr audy in the AVR cant measure that. does Audy measure the whole range of freq from 20-20khz for all the speaker ? what ppl say when select the 3 front speaker is good to hv them in the same range if not brand ? Thanks bro for this valueable tips. After calibration completed for subwoofer. I feel my subw is not strong enough to create boom boom bass. Do I need to turn my subw knob to 11 O clock or increase AVR setting at 3db higher (-3.5db) ? Seeking your opinion bro ! Audy take ref from the internal amp and match yr external sub's level/gain/vol . after cali you should adj the gain from the sub ( single sub ) . why do the center always sounds soooooo soft after calibration.?? i always have to increase the db for center and use dynamic volume (light). anyway when we set the front main speakers to small we also include the center am i right.? That is another problem for Audy , remember most if not all , your center speaker just infront of a Big pic of glass . not apply to all AVR. if you do auto let the Audy set it for you , after that you can try to change to your likin as after the auto, you are not changing any curve or freq eq but only the roll off that yr speaker may respone better as inside most speaker have a Xover and a roll off slope and a lot of time this mis-match cause some issue to match up with the sub and you could get a thin sounding voice or overly warm . Thanks..These tips are very helpful..
1. How to calibrate Two subwoofers connected from a single preout of AVR using Y connector? Switch both subs ON? 2. When to use the antimode (if in use) to calibrate the Subs? Before audyssey calibration or after that ? 3. If the subs are of THX type, how to set the subs prior to calibrate.? THX mode? Hi rhead, I am not surprised that you are having this center channel "too-soft" issue...as many home theater enthusiasts have experienced it at some point in time after the calibration. For me, there is NEVER AN ISSUE with the center dialogue. And nope, I did not engage in any Dynamic Volume as it will not yield good results...trust me, I have personally use it one time and abhor it! And you should not use that as far as possible. Q1) Are the front left and right speakers the SAME MAKE as your center speaker? Q2) How did you position your center speaker? Q3) Did you do a "reference test" using either a SPL meter to measure and ensure that the pink noise (test tone) emanated from the AVR is about the same sound level? Do the "level" (or volume) sound uniform whilst cycling between the front left/right and center speakers? Solution 1: Elevate the center speaker to point at you. Solution 2: Move your seating position further away from the screen, so that the center speaker points at you directly. And yes, you have to re-run the calibration again. Solution 3: If moving your seating position is not possible due to space constraints, perhaps you can consider "elevating" the screen or your TV higher so that you can bring up the center speaker to ear-level. I know you neck is going to be strained...then adjust your recliner chair to a height where you can just lay-back at a comfortable angle. If you dun have a recliner chair, then you should consider getting one. By the way, it is okay to increase the center speaker volume by a few dbs hotter than the rest. Remember getting the LCR right is crucial in a typical 5.1/7.1 setup. Next comes the subwoofer. With these two things solved...I guarantee you will get the best home cinematic experience of your life time.